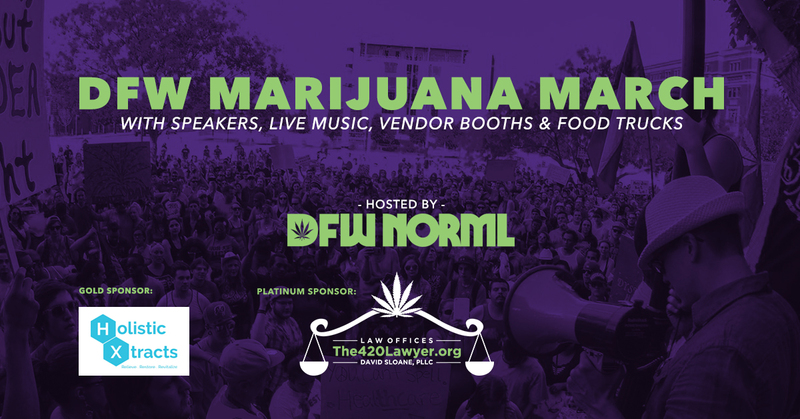 Thousands of Texans are expected to march through the streets of Fort Worth for sensible marijuana law reform at the annual DFW Marijuana March, taking place at Burnett Park on Saturday May 12th, 2018. Festivities include inspirational speakers such as doctors, teachers, veterans, patients, attorneys, and business owners, as well as voter registration, live music, vendor booths, and food trucks. This free-to-attend free speech event is made possible thanks to the friendly cooperation of the Fort Worth Police Department and Fort Worth Office of Special Events, along with generous contributions from Platinum Event Sponsors: the Law Offices of David Sloane and Holistic Xtracts, Inc. Vendor booths are available for $250 until May 10th. Gold Event Sponsorship packages available for $500. Email eric@dfwnorml.org for additional details and to inquire about becoming an official event sponsor.